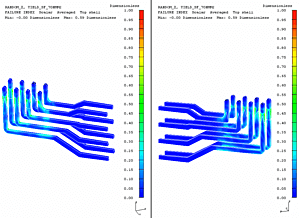 For the analysis and optimization of the structural durability, an FEA model of the inverter was created as shown in the top figure. 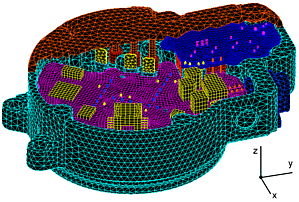 This model contains the housing, the boards, the relevant electronic devices, the busbars and the housing cover, which is partly shown in the figure. The material properties and coupling conditions were determined by a step-by-step correlation between experimental and numerical modal analyses for single components, subassemblies and the complete inverter system. 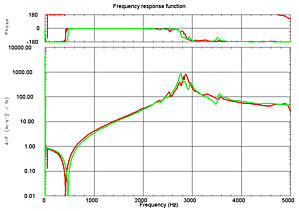 As an example, the mid figure shows the comparison of a single transfer function obtained from measurement and simulation. As an example result from this procedure, the bottom figure shows the failure index of some connection pins due to random excitation in z direction. By this analysis, design weaknesses were identified and targeted redesign measures were developed, so that the serial product passed the challenging vibration tests.